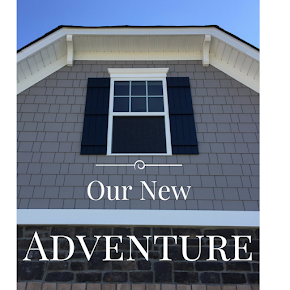 This is a post I've been meaning to write since April. Yeah, I'm organized like that. 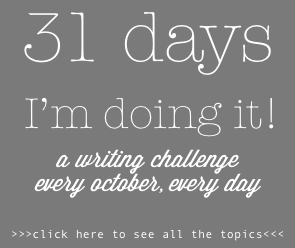 And, apparently, this is the longest blog post in history. Anyhoo, our eldest, D-bug, wanted a ninja birthday party, complete with a Lego Ninjago cake. Now, like every good mom with a Pinterest addiction, I did some searching. And I found PLENTY of cool ideas; however, those cool ideas took a lot of time and talent to pull off ... neither of which I have in large quantities. Then I came across an article in the March 2012 issue of Family Fun magazine (couldn't find link to original article ... sorry!). Now, I'm not a newbie at making birthday cakes for my boys. One thing I've learned is that it can be VERY time-consuming (again, something I don't have much of as a full-time employee and full-time mom). So, I had an idea. Why don't I get my local grocery store to make the cake, and I'll do the decorating?! Awesome! So I did just that. 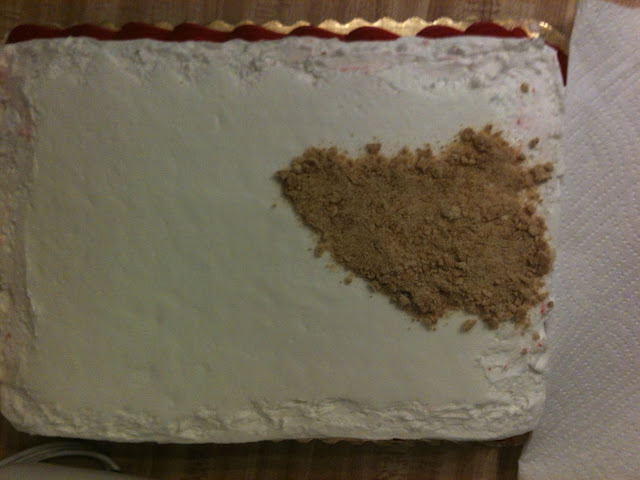 I ordered a 1/4 sheet cake and asked that they decorate it with white icing and red piping just on the bottom. And I went from there. The original recipe called for crushed shredded wheat cereal as the "ground." However, I don't know many munchkins who like shredded wheat cereal, so I crushed up some graham crackers and it worked just fine. 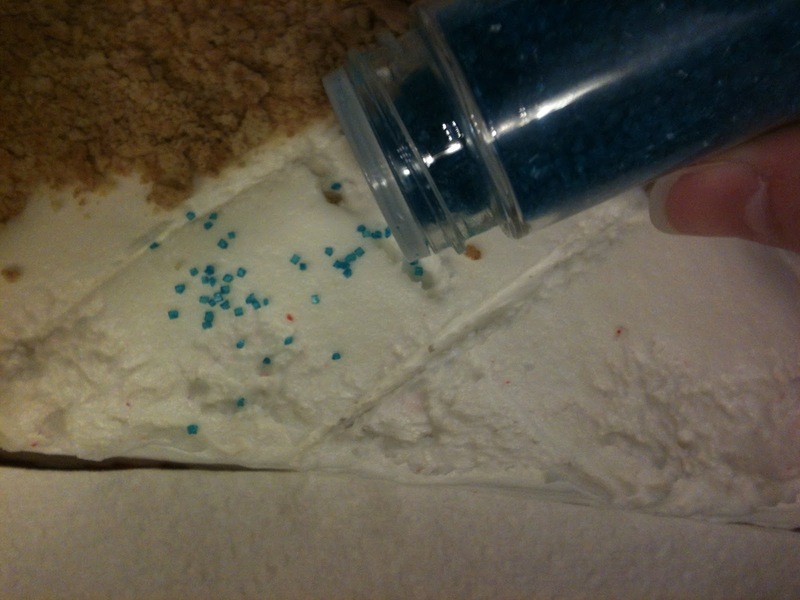 Following the picture from the magazine, I spread out the crumbs to make a training area. Next, time to add the river. (After all, every ninja training ground needs a river.) I used blue sugar sprinkles across one corner of the cake. To make the path easier to see, I drew very thin lines using a butter knife. Next up -- the grassy knoll. No. Not THAT grassy knoll. Since the grass covered the remainder of the white area, I used a paper towel to keep from planting grass in my river. Grass is in the hizzy! OK, every river needs a bridge. 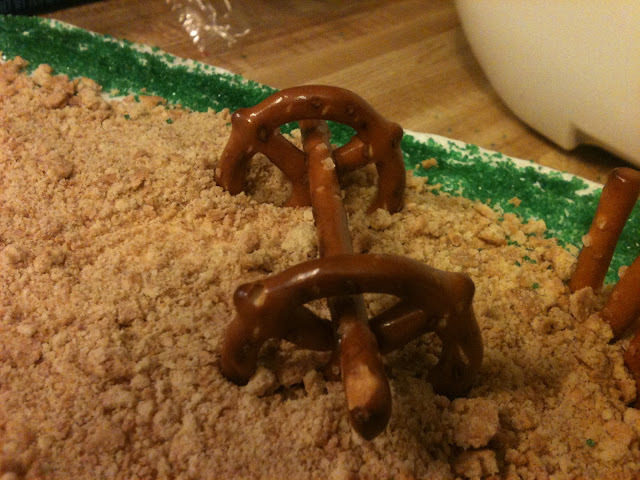 So using 2 regular pretzels, several pretzel sticks and some icing, I fixed one up. 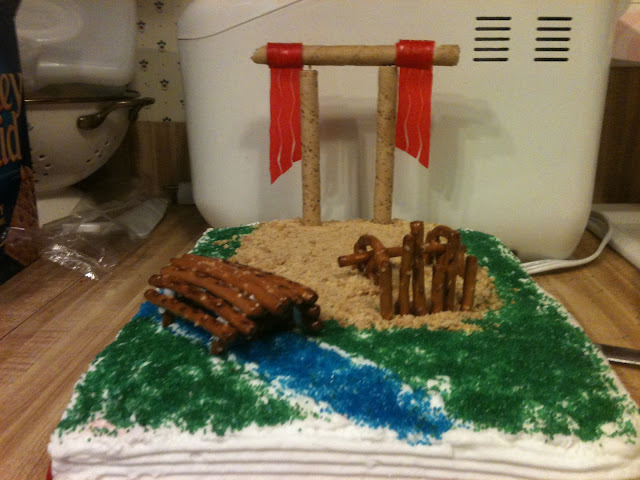 First I placed the two regular pretzels upside down (the side with the two loops) into the river. Then, I spread some icing on them, and pressed the pretzel sticks into the icing to make the boards for the bridge. 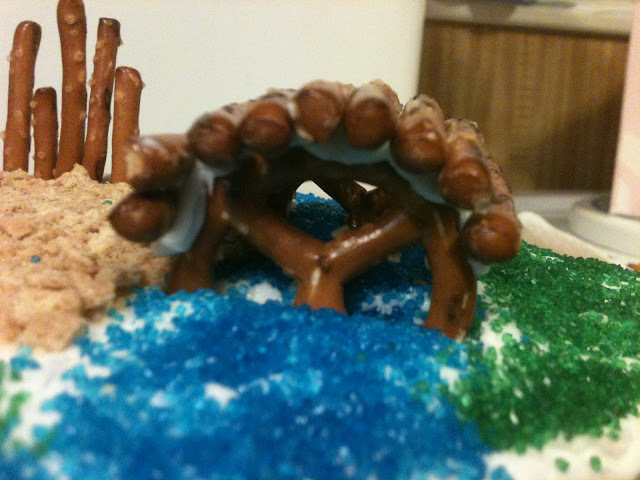 Here's a side view ... see the upside down pretzels? Next up, the balance beam. This was made out of two more upside down pretzels and one pretzel stick. It's really coming together now. Now we need the ninja banners. 'Cuz really ... you can't have a ninja training ground without those cool banners flying in the wind, am I right? These were made with Pirouettes (several of which were scarfed down may have been ingested during the creation of this cake) and Fruit By The Foot. No clue why I only took a pic of these and not the Fruit By The Foot. 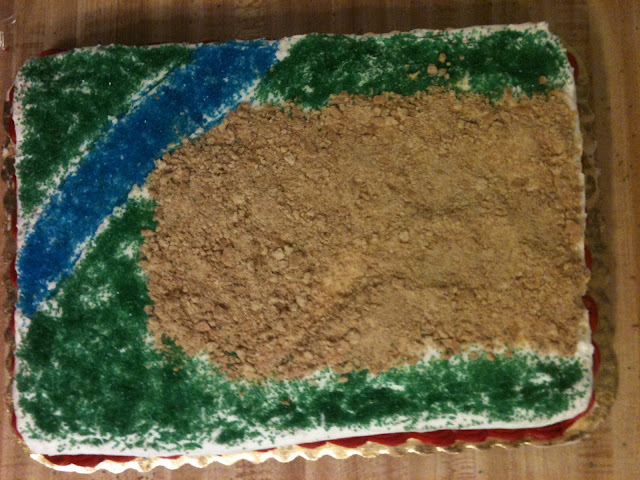 I also cut the edges of the FBTF at an angle and then pulled the edges to look like tattered flags. Awesome, right?! Our training ground is now complete. 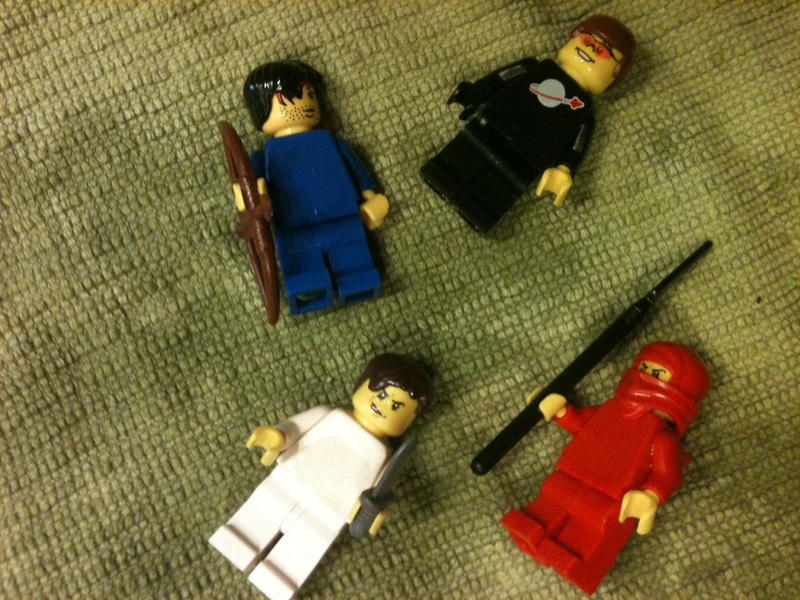 Now to add our ninjas. Yes, these are actual toys my boys play with. But don't worry, clean freaks. They had quite a bath before hitting the training ground. 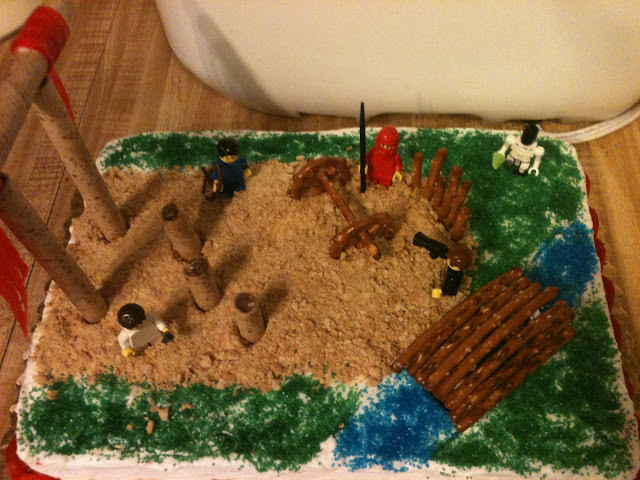 I placed the ninjas in strategic locations around the cake. D-bug helped me with this part. Notice the cylinder-headed skeleton? He's the bad guy. And I think the megaphone is a nice touch, don't you? And there you have it, folks! What may be one of the coolest. birthday cakes. EVER. Now, that's one happy ninja! Finely crush graham crackers. 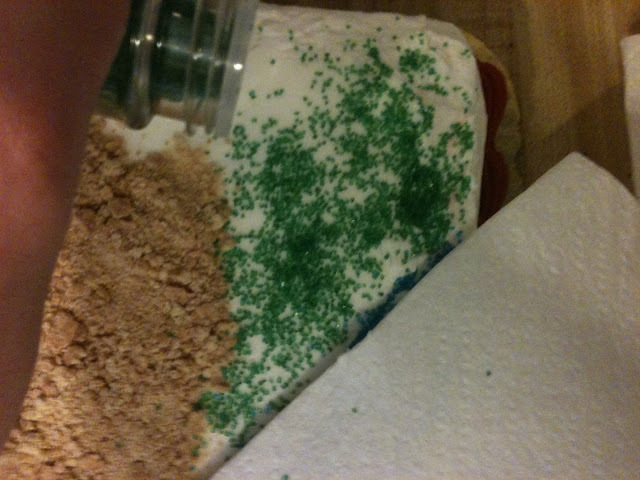 Sprinkle over middle and side of cake to make "dirt." 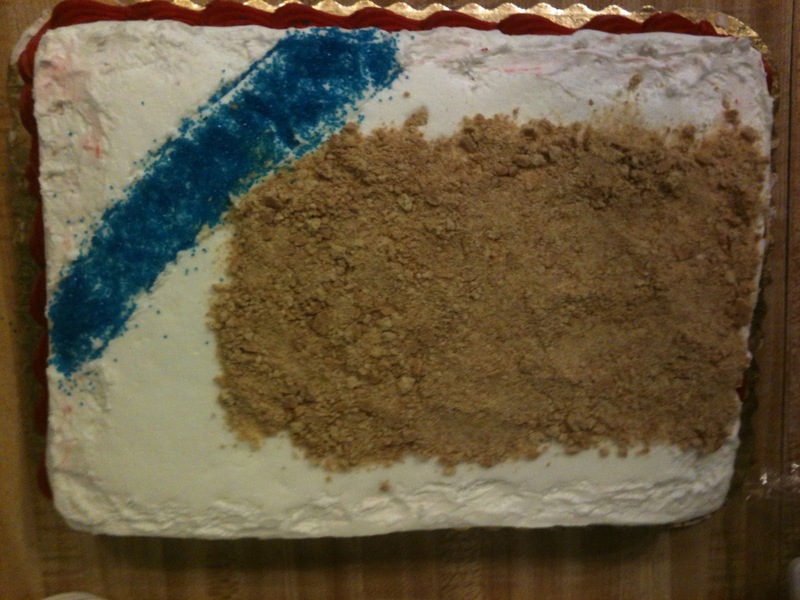 Sprinkle blue sugar across one corner of cake to make the "river." Cover remaining white icing with green sprinkles for "grass." Press two regular pretzels upside down into river. Make sure they are close enough to be covered by the pretzel sticks and allow room for the sticks to overhang. 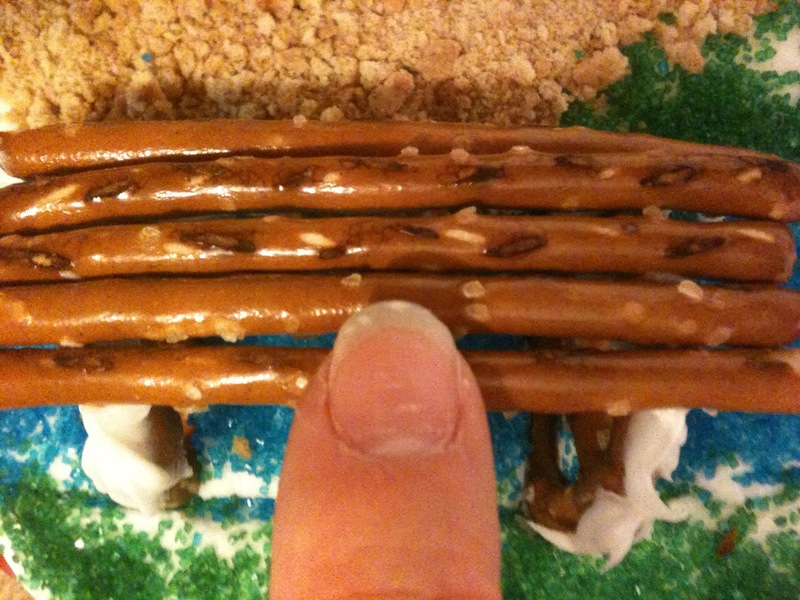 Spread icing on top of pretzels and then press pretzel sticks into icing to make a bridge. Press two more regular pretzels upside down into dirt. Connect by sliding a pretzel stick through the two pretzels to make a balance beam. 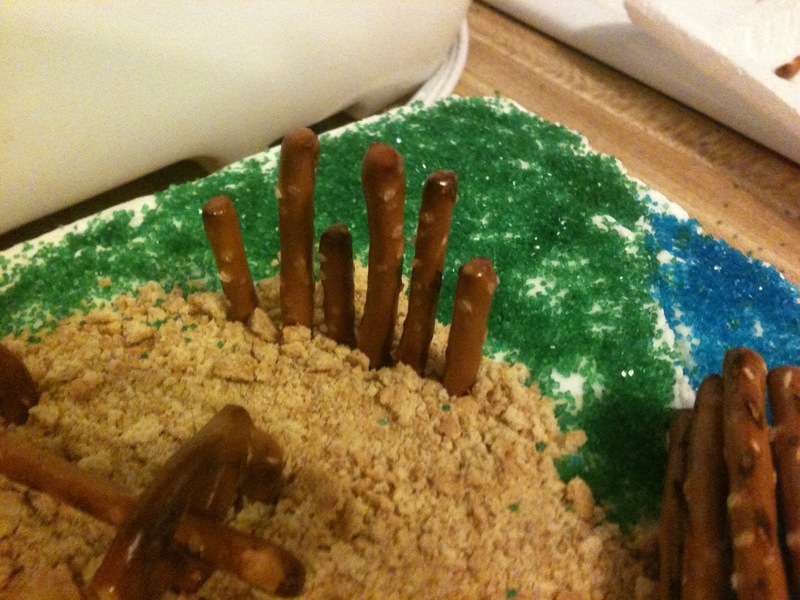 Press pretzels sticks at different heights into the cake to make "stilts." 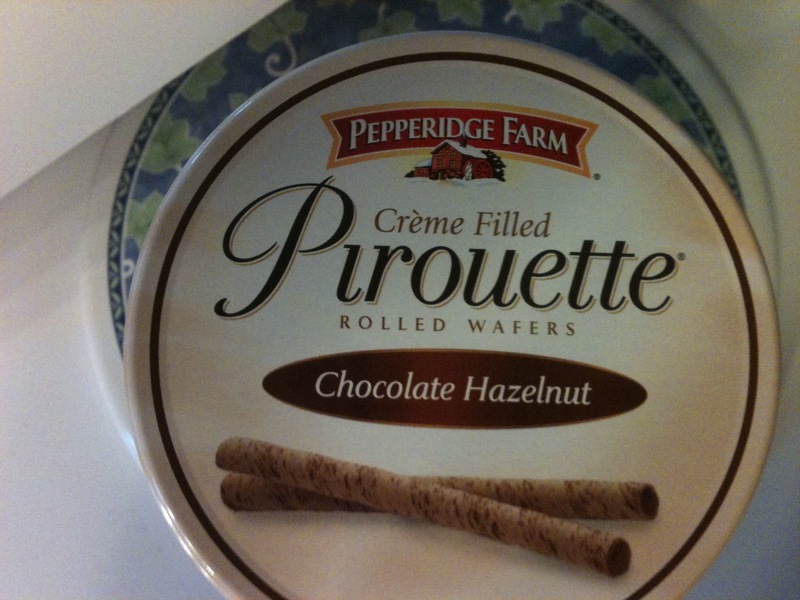 Wrap FBTF around one end of a Pirouette cookie with about 3-4 inches hanging down to make a flag. Repeat on other side of cookie. 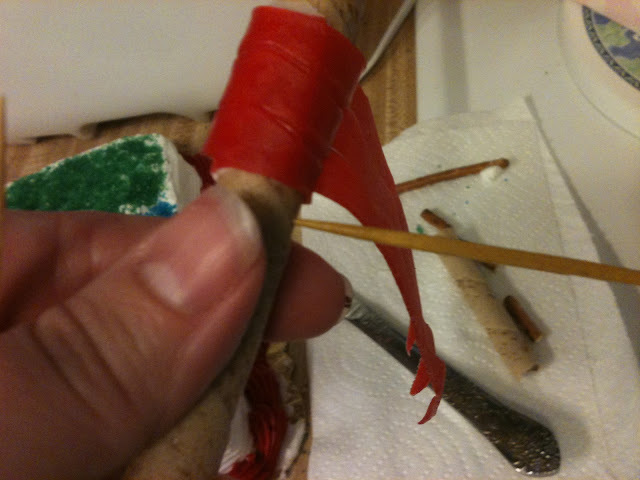 Press toothpick into end of cookie (next to FBTF); repeat on other end. Slide another cookie onto the toothpick; repeat on other end. Press flag poles into cake at one end (opposite the river).